Splish, splash! Oh dear! 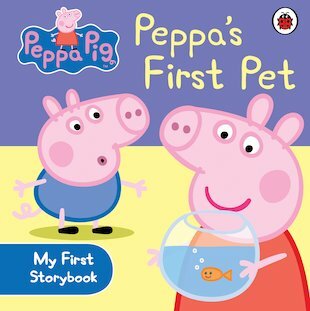 Peppa’s pet fish, Goldie, isn’t eating her food. Join Peppa, George and Mummy Pig as they take an exciting bus ride to the vet to find out what’s wrong! Don’t forget to look out for the extra picture story running through the book. An adorable first story from every little piggy’s favourite TV show, with a sturdy board format and a heartwarming theme about caring for your pet. This is another Peppa Pig adventure that can be related to so many young children. Every one has a first pet and learns how to react and this book makes it seem so easy!